Chassis, sub frame, carbon steel water tank, manhole, water pump, front/side/rear spray nozzle,rear working platform,water cannon,fire valve, water valve, filter gauze,water hose, climbing ladder. water transporting truck, thermal insulation water transporting truck, drinking water tank truck, liquid food truck, fire water tank truck, pesticide spraying truck,and etc. (1) The materail for water tanker is carbon steel Q235,which is very strong. 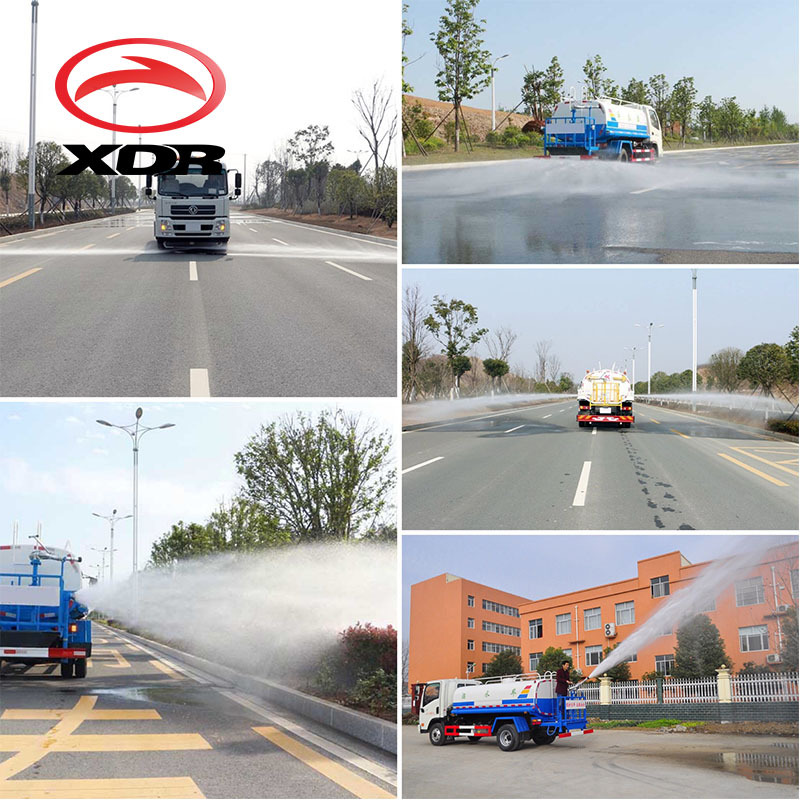 (2) Multipal Function:sprinkling, spraying, cooling, dusting and flushing dust on various roads;road maintenance, landscaping and emergency fire fighting, transportation and water diversion. 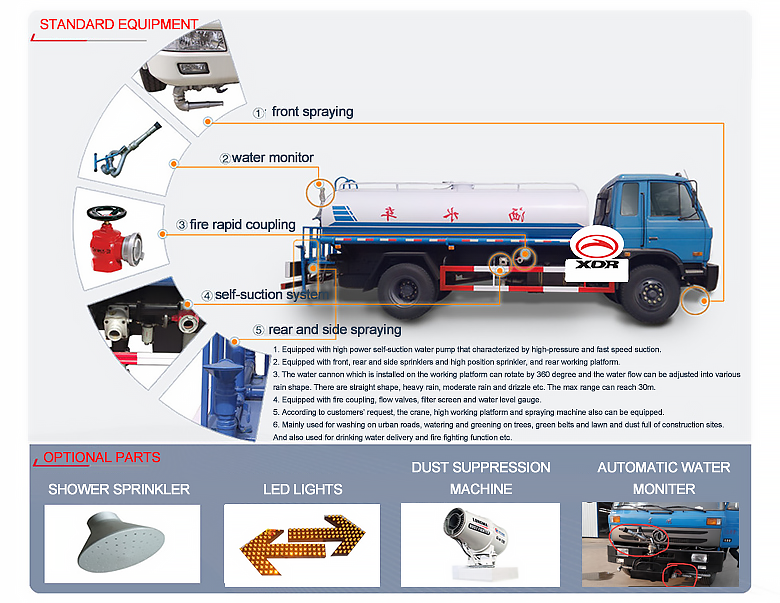 XDR water sprinkler truck can be adjusted for front flushing,rear watering,side spraying and so on. (1) We spray wax to protect the truck before shipment. (2) Waterproof cover and net can be provided for customer's optional choice. (3) If only superstructure body which loaded in container,suitable strong steel support is provided. (4)Standard container,Frame container,Open container,Roro ship are regular sea way shipment way. Road transportation is for road way delivery. 2.Good quality :based on the standard of international request. 1.Q:Trading or Factory? Location ? A: Hubei Xindongri Special Purpose Vehicle Co., Ltd., is one of the most professional manufacturers for special purpose vehciles located in Suizhou City, Hubei Province, China. Our factory covers nearly 80,000 square meters, with own office builing, canteen, workshop, tesing square,etc. A:You will be welcomed here for factory inspection,you could take Plane to the capital city Wuhan Tianhe airport, and we will pick up you from the airport to our wuhan office to have a first visit and communication.Then we will go to Our suizhou headquarters together. A:We have experienced engineer and skillful workers here for your service. 4. Q: Delivery time & Stock & Payment ? A:Please contact us for checking the instant Production arrangment and Stock condition here.Normally 25days. Payment: T/T be prefered, deposit first and balance paid before the delivery from factory. Copyright © 2018 Hubei Xindongri Special Vehicle Co., Ltd. All Rights Reserved.